To improve lives by mobilizing the caring power of communities around the world to advance the common good. TO GET INVOLVED CALL YOUR LOCAL UNITED WAY!!! Help a family this year at Christmas! Interested in helping a family at Christmas this year? Here are some ways you can bring joy to a family during the holiday season! The Salvation Army’s Angel Tree registration will be October 25-26, 2012 from 9am to Noon at The Salvation Army, 16 Felton Place Cartersville. The Salvation Army facilitates Christmas Assistance for Bartow County children ages 12 and younger. Parents must bring a valid photo I.D. and two forms of current, valid identification for each parent/guardian AND child. For more information, contact 770-386-6256. Please see attach flier and share it with your clients and families. Bartow Christmas Coalition registration will be November 2, 2012 from 9:00am-7:00pm @ The Church at Liberty Square Cartersville The Bartow Christmas Coalition is a community project striving to assist needy Bartow County families during the holiday season. Parents are required to provide a valid photo I.D., validation of address (utility bill, mortgage payment), social security card of everyone in home (or tax returns verifying social security number), and proof of household income. For more information contact 770.386.3399 or visit 222.bartowchristmas.org. UNITED WAY OF BARTOW COUNTY ADOPT A FAMILY: If you are someone who would like to adopt a family at Christmas or may need help during the holidays, PLEASE contact United Way at 770-386-1677. WISHING EVERYONE A BLESSED HOLIDAY SEASON! 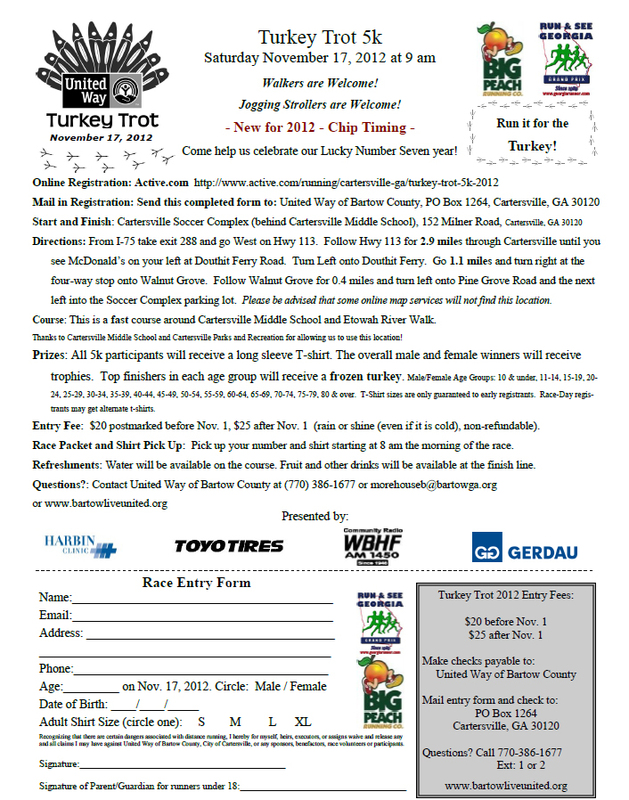 The annual Turkey Trot for the United Way of Bartow County is coming soon. You can register today. Just print out the form by clicking onthe link to the flyer and you are on your way to reserving you place for this chip-timed run. Pledges!! Pledges help us better plan our income & expenses for the year. However, occasional giving is always welcome!! We ask all that food be in-date and unopened. Gift cards to local grocery stores, WalMart, Target, or Staples are ALWAYS welcomed!! and see the Events page. You can print a registration form from the site and mail it is with your registration fees.